If you have a WordPress site or blog, plugins are your new best friend. Plugins are easy to install and offer your site added functionality and new features. Think of them like an app on your phone. They add extras to your site. There are thousands of plugins, both free and paid premium, out there – so if you’re hoping to add sliders to your site, or allow users to comment on your blog or add social icons to your pages, chances are, a plugin will allow you to do so. 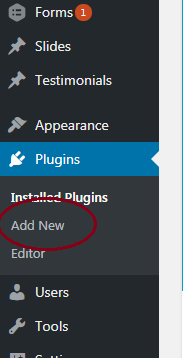 How do you install a plugin on your WordPress site? WordPress has made it easy on you – follow these simple, step-by-step instructions and you’ll be on your way to plugin paradise. For this How-to, I'll walk you through the steps of adding a plugin that will allow your users to share your content via social (tip: if you're not doing this...you should be! ).